Scientists combine two microscopy techniques to chart complex neural networks. Slideshow: Scientists have created exquisitely detailed maps of parts of the mouse brain by combining anatomical information with knowledge of what the different nerve cells do. By infusing cells with fluorescent dye, teams at Harvard Medical School and the Max Plank Institute for Medical Research pinpointed neurons in the mouse visual cortex and retina that responded to specific stimuli, like a beam of light moving in different directions. They then sliced the tissue and used electron microscopy, which can image some of the tiniest structures in cells, to map the connections between the neurons. Armed with knowledge of both how the cells connect and what they do, the teams gained insights into how the brain works. This composite 3-D image from the Harvard team, which shows a half-millimeter-wide chunk of a mouse’s visual cortex, was created by stacking together millions of images snapped of more than 1,000 slices of brain tissue. Building a neural map is an arts-and-crafts project on a gargantuan scale; researchers go through every slice, identifying specific parts of each cell. The round, blue structures are the neuron bodies, the pink strands are blood vessels, and the long blue striations running up and down are the spindly arms known as dendrites and axons that project from nerve cells. Slideshow: The Max Plank researchers applied a dye to a mouse retina. This dye glowed only when neurons were activated. Using a fluorescence microscope to detect the dye, they identified neurons that responded to movements in a single direction (left, right, up, down, and so on). 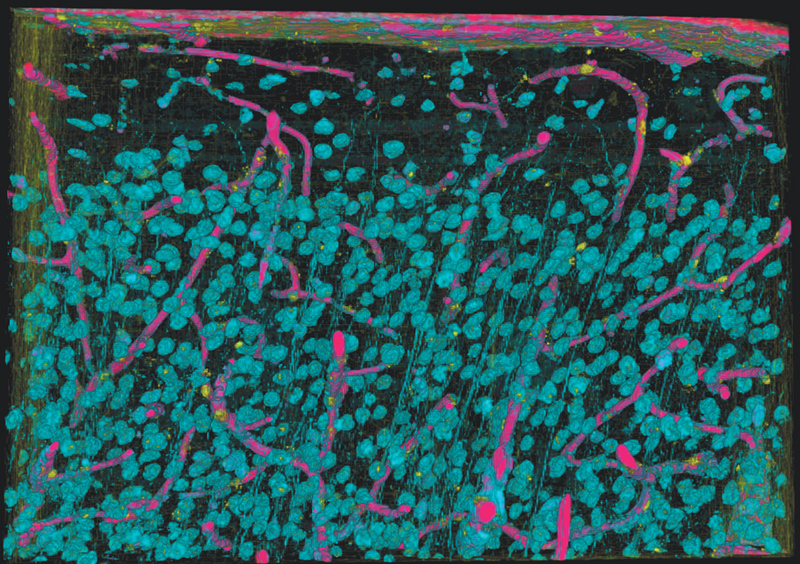 In the fluorescence micrograph at left, retinal neurons are color-coded according to the direction they respond to. Then, using the thick stack of electron microscope images shown at right, the team picked out those cells and began the tracing process. Slideshow: When the tracing was complete, the teams had detailed neural maps showing the cells’ connections. 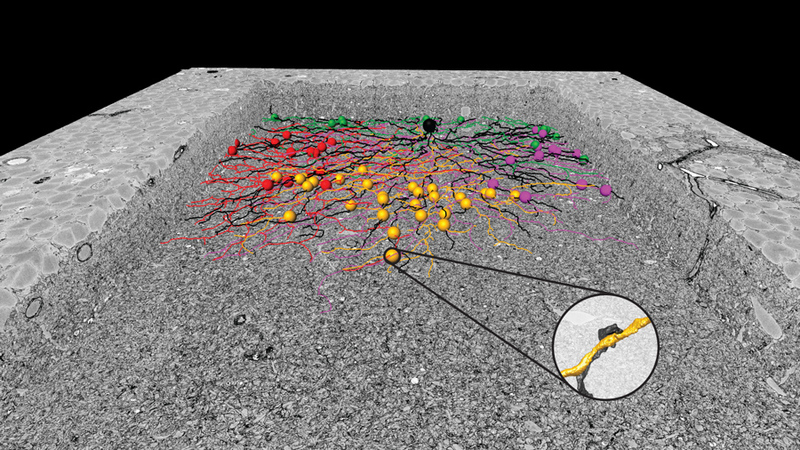 In this neural map from the Harvard team’s study, 14 neurons are colored according to the direction of movement to which they respond. The pale blue neurons are connected to those 14 neurons via synapses. 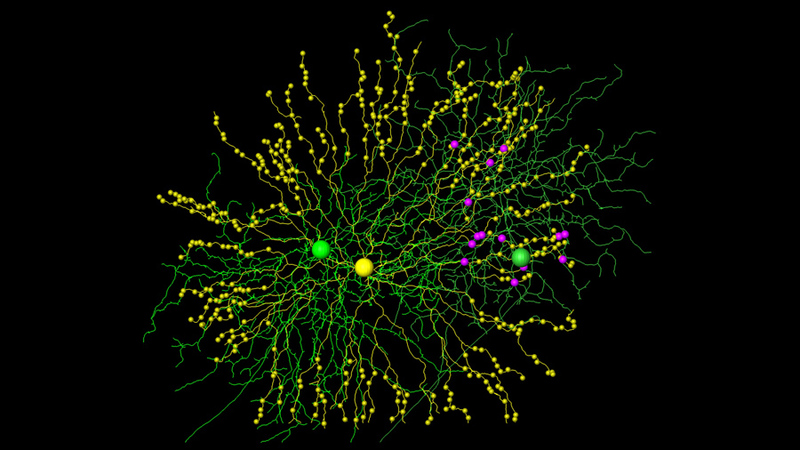 Unlike other techniques, this approach allows scientists to easily explore all the connections that a particular neuron of interest makes in the network. Slideshow: Though some of the process was automated, much of the analysis was done by hand. 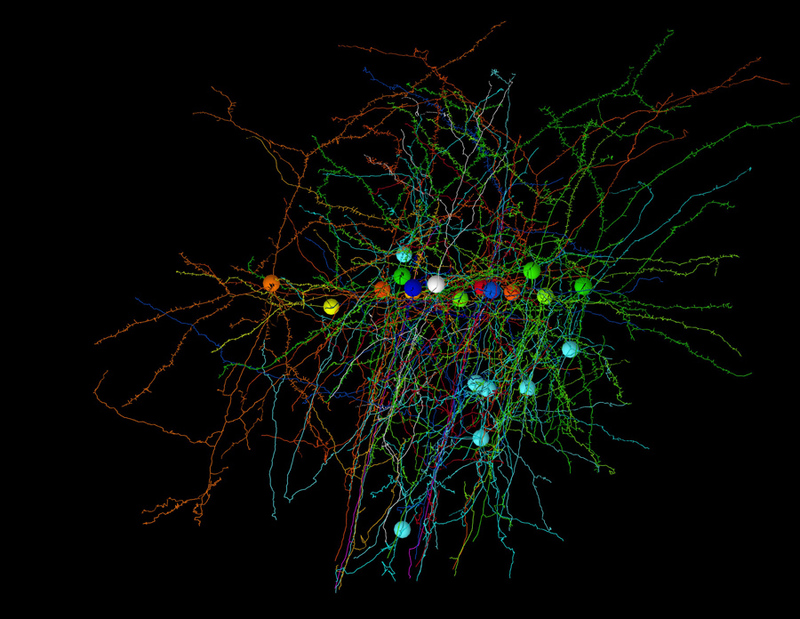 It took 20 to 40 hours of work to trace a single neuron for a neural map like this one. The next step for the field, both teams say, is developing artificial intelligence algorithms that can trace neurons without human input. Slideshow: The sheer amount of information provided by each of these two data sets is staggering. 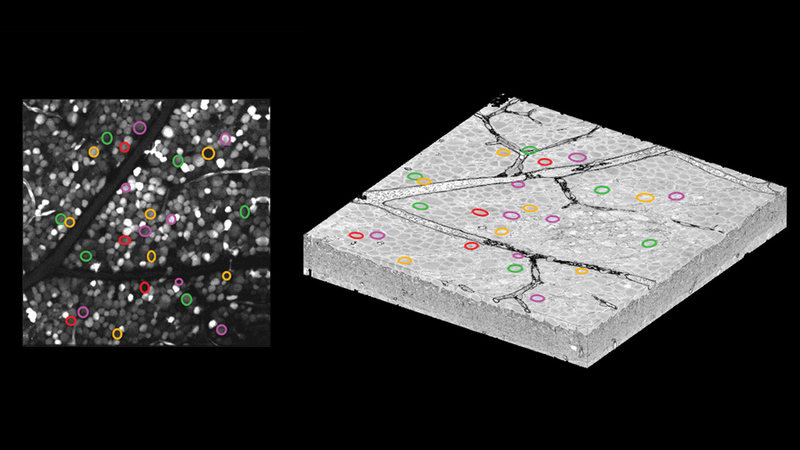 Here, a neural map from the Max Plank Institute team is laid inside the stack of electron microscope images from which it was created to show how the two overlap. But there’s more to it than the large-scale connections between cells—zoom in far enough, and the physiology of individual synapses is visible, as shown in the inset. Reid, courtesy of Nature. ; Kevin Briggman, Max Plank Institute for Medical Research, courtesy of Nature.